Flipboard is a great reading app for the iPad. Flipboard was named Apple’s iPad App of the year and one of Time’s Top 50 Innovations. It creates a personalized magazine out of everything being shared with you. Fill Flipboard with things you like to read. It creates a single place to enjoy, browse, comment on and share all the news, photos and updates that matter to you. Subscribe to your own twitter timeline. Flipboard will make the tweets and turn it into a magazine. For now you only get two screens of content so use it well. Want YouTube videos without ads, video suggestions or comments? 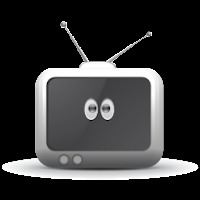 Use safeshare.tv or, simply replace watch?v=with v/in the URL. Once you have created your new link, use it to show the video to your class or to create a QR code. You will have a larger viewing area without all the YouTube extras. Disclaimer: This does not work with all YouTube videos. 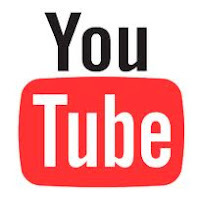 YouTube offers a new line-up of educational channels for students and teachers. Select All Categories to find your subject. Are you a Dropbox user consistently receiving emails from co-workers or students with attachments? Why not setup FileStork with your Dropbox account and make the process streamlined? FileStork is a service for Dropbox users to accept uploaded files from other individuals directly to their Dropbox account without sharing a folder. Read a quick review about Dropbox here. It’s as easy as logging in to your Dropbox account and authorizing FileStork to access your Dropbox folder. FileStork will never access your Dropbox username and password. Then, a designated “FileStork” folder will be created and files will be placed into that folder. A wide variety of files types are allowed such as documents, images, video, audio, web, text-based, scripts, executable, and more. Files up to 75MB are allowed. Visit https://filestork.net/ and start requesting files! Many students use google images to find pictures for projects. Although google images can be handy and easy to use, the images are not always copyright free and legal to use. Read more here. As teachers, we need to teach this concept to our students. Two places to find royalty free images are wikipedia.org and schools.clipart.com(within district). When using wikipedia, students can click on an image, scroll down and read the copyright information about the image. Many times, graphics found on wikipedia are designated as Creative Commons. Within GCISD, users can access schools.clipart.com to find a variety of clipart, photos, and web images that are all copyright free. GCISD has a paid subscription to this resource and teachers and students can feel confident in using it. This article sums up the issue of copyright nicely. Take a few extra minutes to integrate this lesson of copyright into your research projects. Most of us are always on the lookout for an engaging new way to utilize a drawing app in the classroom. 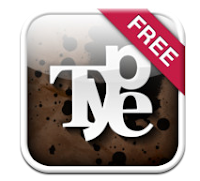 Here comes TypeDrawing for FREE to the rescue! If you have other ideas on how this app could be used, we'd love to hear them! Post your ideas in the comments section below. Yesterday you learned how to do some basic editing to your iPad pictures. Did you know that you can also trim videos right in the camera viewer without having to open them in iMovie? It's simple! Sometimes when you record video you get extra footage at the beginning or end. To trim it, just tap the screen when you're viewing your video. Drag either end of the frame viewer at the top of the video to the desired location and tap Trim. Choose "Trim Original" if you want the trimmed frames to be permanently deleted from the original video. Choose “Save as New Clip” to create a new video clip in your Camera Roll album and leave your original video unaffected. While not new to the latest Apple software update for iPad and iPhone, this was new to me. You can do some very basic editing of pictures within the Photos app. To enlarge any of the pictures below, simply click on them. After taking a picture (or a screenshot, as in the example below), view the picture full screen in the Photos app. When editing photos, the original will not be saved, so you may want to make sure you have a couple copies of the original. 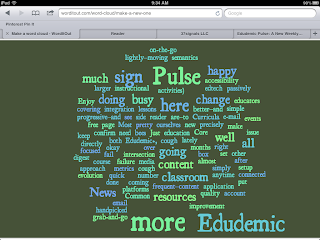 I had zoomed in on the word cloud already before taking the screen shot. Tap the picture to bring up the toolbar at the top. Tap Edit. At the bottom, you'll notice four tools: Rotate, Enhance, Red-Eye and Crop. Rotate and Red-Eye are pretty self explanatory. Enhance will automatically make color adjustments for you. Click Crop. A grid will be placed over the picture. Until recently, my experience with Twitter has been limited to just following gossip blogs, famous people and educational companies. While at a Region X/XI meeting, my eyes were opened to a completely different use for it. TweetDeck (http://www.tweetdeck.com/) is a free download for Mac and PC that allows you to view and organize your twitter feed in ways you never thought possible using columns. With this program, you can add columns to your deck based on lists of people you follow or hashtags for which you regularly search. Instead of having a single timeline, you will have multiple feeds based specifically on your interests. Simply click Add Column in the top left corner and set your parameters. I like using the Search and Lists parameters.